News and information about piping and events throughout the Highlands of Scotland. If there is one occupation that equals that of being a player of the Great Highland Bagpipe, and Piper on Parade in particular, then it’s got to be ‘The captain of a Loch Ness Cruise vessel’. 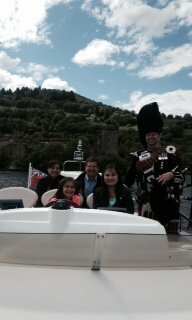 What a thrill to spend your days bobbing along on the world renowned and spectacular Loch Ness. Piper on Parade had been invited to come along on board the Highland Free Spirits ‘Eilidh Catriona’ whilst it toured the Loch with a number of guests. 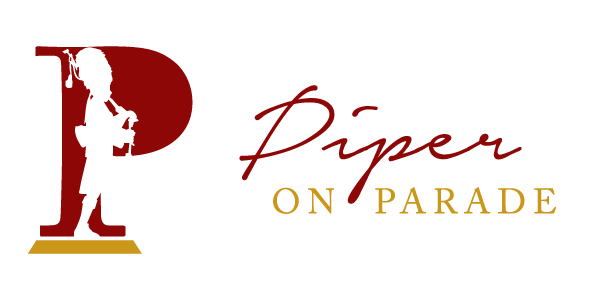 The piper was to entertain with some fine Scottish music, give a talk on the instrument, including history surrounding Highland Dress, and for the teenagers amongst the group; indulge their interest in piping with a chanter lesson. On leaving the berth at Dochgarroch and cruising slowly along the Caledonian Canal, Aldourie Castle quickly became visible nestled among some trees with its green lawn stretching down to the Loch side. It was a beautiful scene. The piper took a stance on the open bridge and played a selection of slow Highland airs to set the atmosphere, thankfully it was not raining and not rolling (too much!) although as the canal widened and entered Loch Ness, Captain Garry opened the throttle, whereupon the piper feverishly clutching his feather bonnet and pipes beat a hasty retreat to the salon below where the atmosphere was more civilised for piping. As we sped along it wasn’t too long before we glimpsed Urquhart Castle ahead, the view from the Loch was stunning. Time for some more piping as we slowed and circled below the ancient walls. It was great fun, with lots of opportunities for some photographic memories. Having listened to Garry’s Loch Ness Monster stories it was time for a spot of lunch and where better than in the nearby Drumnadrochit Bay. We didn’t so much drop anchor but switch off the engine and drifted a little. Our steward for the day; Bruce, rustled up some smoked salmon and champagne and the piper began his talk which very quickly became a discussion. There’s nothing quite like audience participation; it makes the speakers task that bit more comfortable. Food, champagne, talk & discussion completed, it was time to make our way back up the Loch. Bruce tidied up as Garry started the engines and manoeuvred us in the direction of Dochgarroch. Piper on Parade broke out the practice chanters and had a great time enlightening the teenagers on the intricacies of The Great Highland Bagpipe music. You would think having a trumpet and viola player in the group may have made the task easier. Simple answer No! But hey, it’s all about the challenge. Needless to say the fun was in the trying. It was a terrific afternoon and the panoramic setting was out of this world. The sound of the pipes across the water, and echoing off the ancient walls of Urquhart Castle with all its history was just magical, and not a little emotional for a number present. Ps. Not a hint of a monster anywhere!